When the metal looked ready to pour, I stopped the air blast, removed the lid and lifted the crucible out with vise-grips and welding gloves. 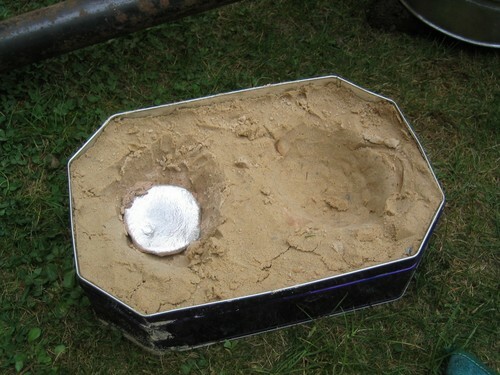 I poured the molten metal out into a biscuit tin containing sand. It was masonary sand, which contains quite a bit of water so there was some steam and a little bit of bubbling. But hey, there’s my first bit of melted aluminium.